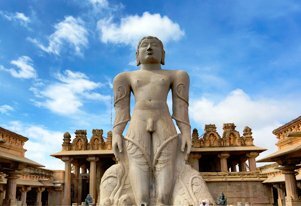 Karnataka is one of those places in India where giant Jain statutes can be found. The state pays due respect to Jainism and thus has some of the finest pilgrimage sites that are a must visit. In our 4N/5D Jain Tour in Karnataka, we shall endeavour to cover to most significant places of this religion. Embark on a journey with us to Bengaluru, where we would first explore the rich heritage of the state in the form of Tipu Sultan's Palace, Bull Temple and Lalbagh Botanical Gardens. We shall then head out to witness the gigantic statue of Gometshwara or Bahubali at Shravanbelagola. After done with paying homage this sacred Jain site, we shall also visit Chandragiri and Indragiri along with Cave of Bhadrabahu, where the sacred foot of Sritakavalli is worshipped. The Manasthanbha Shrine is also a place in Shravanbelagola where we shall bow our heads. At Moodabidri, which is the major pilgrimage site in South India, we shall soak ourselves in spirituality at 18 Jain Temples. Ammanavara Basadi, Guru Basadi and Tribhuvan Tilak Chudamani Basadi are amongst the main Jain shrines here that shall attract our major attention. Upon arrival at Bengaluru airport/railway station, meet our representative who will assist you to the hotel. In the afternoon, we will visit Tipu Sultan's Palace, Bull Temple and Lalbagh Botanical Gardens. Overnight stay at the hotel in Bengaluru. Post breakfast at the hotel, we shall leave for excursion to Sharvanbelagola. The place is known for its giant statute of Gomateshwara or Bahubali. We will see Chandragiri and Indragiri along with Cave of Bhadrabahu, where the sacred foot of Sritakavalli is worshipped. We will also visit Manasthambha Basadi,where there is a beautiful pillar constructed in 17th century. Overnight stay at the hotel in Bengaluru. After the breakfast today, we shall drive to Mudbidri/ Moodabidri. Enroute we will also visit Dharmasthala where the deity of Shiva is worshipped in the form of Manjunatha. On arrival at Moodabidri, check-in at a hotel. Rest of the day will be kept free. Moodabidri is an old temple town, better known as the 'Jain Kashi'. Overnight stay at the hotel. Today, we shall go for sightseeing in Moodabidri, which is one of the major centres of Jainism in South India. There are as many as 18 Jain Temples in Mudbidri that were constructed between the 14th and 16th century. 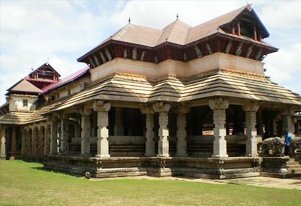 Amongst the 18 Basadi (temple), the most famous are Ammanavara Basadi, Guru Basadi and Tribhuvan Tilak Chudamani Basadi. We will also witness the Parshawanatha stone idol in the Guru Basadi. The rare Jain palm leaf manuscripts, which are known as 'Dhavala texts' are preserved in this Basadi/Temple. We will also include Tribhuvan Tilak Chudamani Basadi or the Thousand Pillar Temple, which is ornately carved in the Vijayanagar style and is the largest amongst all temples here. Overnight stay at the hotel. After the breakfast at the hotel, we shall transfer you to Mangalore airport/railway station to take the connecting flight/train for onward destination.